The sacred month of Ramadan 2019 is almost upon us, which always bring a great opportunity for Muslims to seek maximum blessings. Ramadan is the ninth lunar month and its first day starts with the appearance of the moon at the end of Sha'ban (eighth month of the Islamic calendar). With 2.7 million Muslim, majority residing in London, England, Islam is third largest religion in United Kingdom. The fasting duration in UK is used to be longer in comparison to most parts of the world. 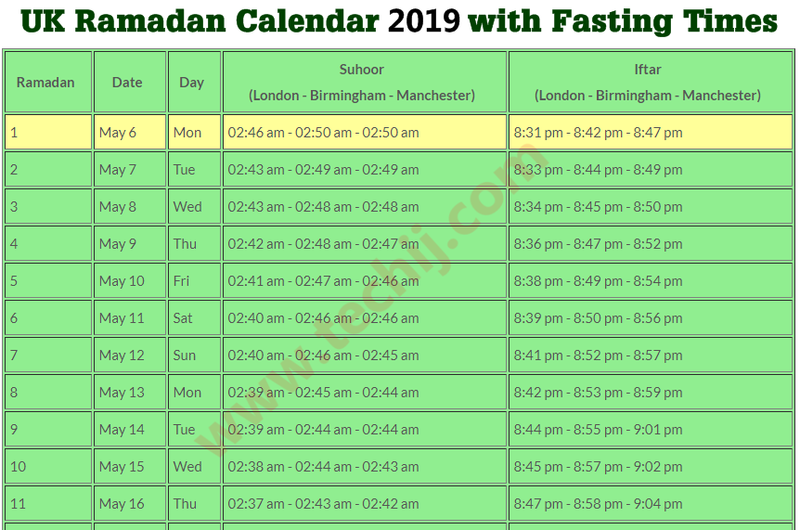 As you can see in Ramadan 2019 calendar that, the fasting duration on the first day of Ramadan in London, UK will be 18 hours and 34 minutes. And the longest fast will be observe on 21st of Ramadan which is 18 hours and 55 minutes long. It will start at 2:26 am and will end at 9:21 pm as per prayer times calculated using Muslim World League method. For Hijri dates, Muslims of UK are divided into two communities, the one who follows Saudi Arabia and, the other group of people follow Ramadan dates announced by the Coordination of Major Islamic Centres and Mosques of London. On the evening of 5th May 2019, Ramadan moon can be seen by use of optical aid or even by naked eye in Saudi Arabia. But in UK, it is not much easy to see Ramadan crescent by naked eye but can be seen by use of optical aid on 5th May evening if weather remains clear. So, the first day of Ramadan 2019 in UK will begin from 6th May, Monday, communities that follows Saudi Arabia, else Ramadan 1440 first day will be on Tuesday, 7th May for communities that follow local sighting. Similarly, Ramadan 2019 can be 29 or 30 days long depending on when did they observed their first fasting on the month. As the last day of fasting month in UK will be on 4th June, Tuesday, in all ove UK. You may also download Ramadan month fasting schedule for more cities by clicking on there names; London, Birmingham, Manchester, Leeds, Leicester, Glasgow, Sheffield, Bradford, and Edinburgh. "O you who believe! Observing As-Sawm (the fasting) is prescribed for you as it was prescribed for those before you, that you may become Al-Muttaqoon (the pious)." By these following verses, it is crystal clear that Allah wants the piety of the believer rather than his hunger or thirst. Fasting ultimately helps the Muslims to avoid the forbidden and it helps to fulfil the commands of Islam altogether throughout the rest of the other months. Fasting is a tool that automatically makes us thankful for all the pleasures and luxuries we enjoy without showing any gratitude to the giver (Allah). It is incumbent upon us to realise that when all the great pleasure of our life are kept away from us like eating, drinking etc we come to value those things even more while abstaining from them. This act triggers us to be grateful to Allah. It must be noted that these things inculcate in us without our conscious mind getting to know it. Such is the mercy of Allah. Hence fasting is a cure to the disease of illegal desires, this is because in comparison to the hunger and thirst the intensity of those desires subsides and they lessen as the Muslim continues to fast.